Heat-related illnesses are common and sometimes deadly but preventable. 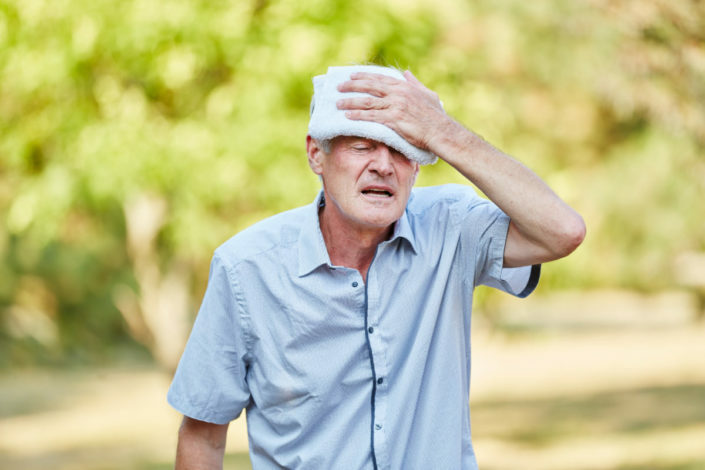 Learn the warning signs and symptoms of heat-related illnesses so if you or a loved one shows any distress you will know what to do. What you need to look for is a high temperature of 103 or higher. Hot, red, dry or damp skin along with fast and strong pulse. You will get a headache, feel dizzy and experience nausea. You can start to feel confused and even pass out. What you need to do is call 911 right away. Heat stroke is a medical emergency. Move the person to a cooler place and help to lower their body temperature by applying cool cloths or bath. Do NOT give the person anything to drink. What you need to look for is heavy sweating along with cold, pale and clammy skin. Nausea or vomiting is common along with muscle cramps. You can also feel dizzy, weak, get a headache and faint. What you need to do is move to a cool place and loosen your clothing. Put cool, wet cloths on your body and take small sips of water. You need to call 911 if your symptoms get worse, last more than an hour and it you are throwing up. What you need to look for is heavy sweating and muscle pain or spasms. What you need to do is stop any physical activity you are doing and move to a cool place. Drink water or a sports drink that contains electrolytes. Wait for cramps to go away before starting up any physical activity.